KING KHAN & The SHRINES will be at SONS OF HERMANN HALL Monday Night with Miami, FLAs JACUZZI BOYS!! They sold out Mohawk this past Saturday in Austin!! All Ages, $16 frontgate tickets. I heard they’ll be eating at the Original Sonny Bryan’s on Inwood sometime this afternoon! ALSO!! look for 35 Denton street team tonight, we;ll be giving away some passes for the fest. 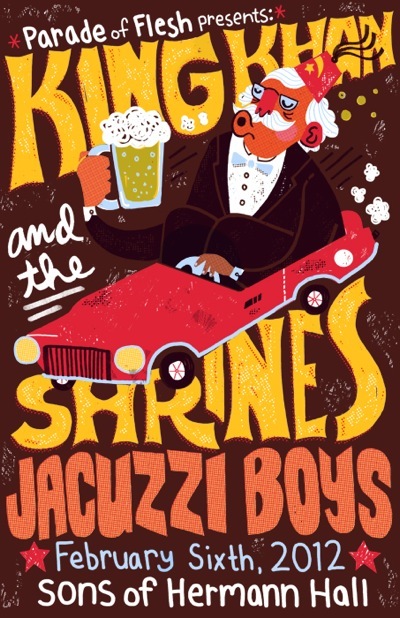 This entry was posted on February 6, 2012 at 10:00 am, filed under News and tagged 1969s, Jacuzzi Boys, King Khan, Shrines, sons of hermann hall.